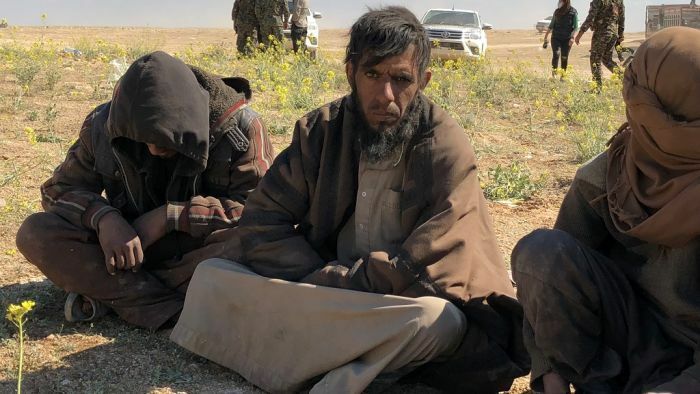 Around 1,000 Islamic State fighters have handed themselves in to the Syrian Democratic Forces (SDF) after negotiating their surrender from the last stronghold in Baghouz. At a clearing ground just outside the battlefield, the ABC spoke to a group of IS fighters who were pleading for medical treatment. An Egyptian man said the group came out as part of a negotiated surrender. “They say they have a deal that the injured people have to go to hospital to get care, then everybody will go to jail and we say, ‘okay, we are happy to get out of this fight”. They had been sitting in the desert for three days without any help, he said. Two of the group had died that morning. He said living inside Baghouz was terrible, “it’s shocking, it’s really shocking”. An injured Syrian man writhed on the ground beside him. A wound on his lower leg was open, infected, and infested with maggots. “He was bombed six days ago, his bones are broken and he hasn’t had any help. Small children sat amongst them. There were no women in the group. The children’s mothers are presumably dead. Nearby, the latest batch of surrendering IS fighters sat on the ground, waiting to be searched by US soldiers. Many deny fighting for the Islamic State. The scenes here in the desert outside Baghouz stand in such contrast to the IS propaganda of the past five years. “I was a civilian, I was a private driver,” said Alaashakir from Iraq. He claims the Islamic State forced him to join when they invaded his town. “I didn’t have a chance to get out from ISIS territory. Alaashakir said it’s up to the SDF if they believe him. He said he was glad that his time under IS rule was over. Nearby, another group of women and children were loaded into trucks headed for refugee camps further north. The last to be loaded into the trays of the vehicles were the sick and injured, including newborn babies and infants. Many of the children are suffering from malnutrition. Survivors from Baghouz say it’s been weeks since they have eaten properly. There’s no medical care available here, just outside the battleground, and it’s likely many of the sick children won’t survive the long overnight drive in freezing conditions to refugee camps in Syria’s north.